When contemplating this picture it is useful to bear in mind that the second half of the nineteenth century was a period remarkable for archaeological researches and discoveries, especially by English expeditions. The British Museum was a treasure house of antiquities increasingly valued by artists as a reference library. Egypt and the Middle East replaced Greece and Italy as the focus of curiosity. 'The visit of the Queen of Sheba to King Solomon' can be contextualised against a craze for orientalist narratives in literature, music and visual art. The wildly composite architectural system of Solomon's temple is reprised in the frame, which bridges the temporal and spatial distance between viewer and subject. The artist has been so obsessed with the accuracy of his details, however, that the figures seem somewhat doll-like. Trained in Paris under Gleyre, Poynter was at heart a Salonist for whom artistry resided in weight of detail rather than dramatic synthesis. Signed and dated l.r., brown oil "18 EJP [monogram] 90". Unknown, Mansion House (Guildhall) one-picture exhibition by living artists in 1900, Mansion House, 1900?–1900? Thomas McLean Gallery, London/England, Purchased by the AGNSW from Thomas McLean Gallery 1892. Purchased by Thomas McLean from the artist 1890. Roger Benjamin, Look , 'The Romance of Arabia – Orientalsim – Delacroix to Klee', Heidelberg, Dec 1997, pp 14–17: p 16. R B, Archaeological Diggings , ‘Seeing the Queen of Sheba in Australia’, Hornsby, Aug 2002, p 20, col illus p 20.
one of his models (from the Pall Mall Budget)’, Sydney Morning Herald , ‘About Mr Poynter’s great picture, Sydney, 06 Aug 1892, p 5. Edmund Capon, Great philanthropists on trial : the art of the bequest , ‘The James Fairfax collection', Melbourne, 2006, pp 126–35: p 134. Jackie de Diana, Look , ‘Realism to surrealism: the Society’s art appreciation lecture series for 2014', Sydney, Nov 2013, pp 28–29: p 28. Paula Dredge and Alan Lloyd, Paintings conservation in Australia from the nineteenth century to the present: connecting the past to the future: contributions to the eleventh AICCM paintings group symposium, National Gallery of Victoria, Melbourne 2008 , ‘The sub-committee and the restorer: conservation at the National Art Gallery of NSW 1899–1910’, Canberra, 2008, pp 25–37: pp 26, 29–30, illus pp 34, 35. Detail from a photograph of 1900. Caroline Dunant, Melodrama: stage, picture, screen , ‘Olympian dreamscapes: the photographic canvas: the wide-screen paintings of Leighton, Poynter and Alma-Tadema’, London, 1994, p 87, illus p 86. Donato Esposito, British Museum Magazine , 'Inspired by Antiquity: Sir Edward Poynter and the British Museum', London, Spring 2002, pp 22–25: pp 24–25, col illus p 25. Michele Field, Sydney Morning Herald , ‘London toasts Sheba, but she’s a Sydney girl’, Sydney, 13 Aug 2005, p 5, illus p 5. Gallery shot. Cedric Flower, Bulletin , ‘Art: Victorians in NSW’, Sydney, 19 May 1972, pp 38–39, illus p 39 (detail). Renée Free, Art Gallery of New South Wales handbook , 'European', Sydney, 1988, pp 43–44, col illus pp 46–47. Renée Free, Art and Australia , 'European collection', Sydney, Jul 1972, pp 63, 67, col illus p 70. Art Gallery of New South Wales special number. Renée Free, AGNSW Collections , 'The Western Heritage, Renaissance to Twentieth Century', Sydney, 1994, p 133, col illus p 133. Dr Colin Hope, Gold and civilisation , 'King Solomon and the Queen of Sheba', Canberra, 2001, p 114, col illus p 114. Robert Hughes, Nation , ‘Grandad’s gallery: some plain words from Mr Missingham’, Sydney, 19 Dec 1959, pp 19–20: p 20. Alison Inglis, Melbourne Art Journal , ‘The Margaret Manion lecture 2001: “The Queen of the South” archaeology and empire in Edward J Poynter’s The visit of the Queen of Sheba to King Solomon’, Melbourne, 2001, pp 25–39. Alison Inglis, Oxford Dictionary of National Biography , ‘Poynter, Sir Edward John, first baronet (1836–1919)’, Oxford, 2004. Alison Inglis, The dictionary of art , ‘Poynter, Sir Edward John’, London, 1996, vol 25, p 406, illus p 407. F Hamilton Jackson, Architectural Review , ‘The Work of Sir E J Poynter, PRA, viewed mainly from its decorative side’, London, 1897, pp 2–13, 51–63, 118–30, 155–66, 224–31: part 4, p 164. Bruce James, Art Gallery of New South Wales handbook , 'Western Collection: Paintings and Sculpture', Sydney, 1999, p 45, col illus p 45. Adrian Margaux, Windsor Magazine , ‘The Art of Sir Edward Poynter, RA’, London, Jan 1903, pp 67–82: pp 80–82, illus p 75. John McDonald, The Sydney Morning Herald , 'How the west was won over', Sydney, 20 Dec 1997, illus p 12. Appearing in the 'Spectrum' section of Sydney Morning Herald. Cosmo Monkhouse, Easter Art Annual for 1897 , ‘Sir Edward J Poynter, President of the Royal Academy: his life and work', London, 1897, pp 2, 23, 32, illus p 21. Preparatory drawings illus pp 1, 3. Extra number of the Art Journal. Kineton Parkes, Igdrasil , ‘A note on the pictures of 1890’, London, 1890, pp 283–86: p 284. Peter Raissis, Look , 'Rehanging the Old Courts', Heidelberg, Mar 1997, p 9. 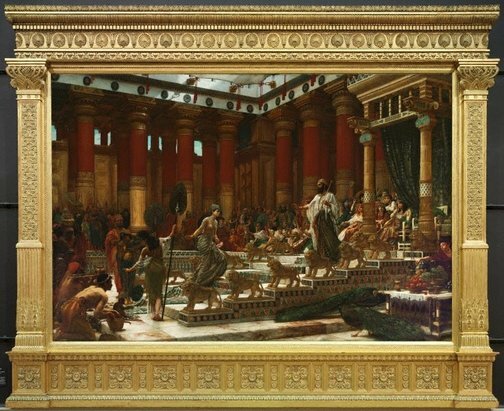 Malgorzata Sawicki, AICCM Bulletin , ‘The visit of the Queen of Sheba to King Solomon by Edward Poynter, 1884–1890 – The frame revisited’, Canberra, 2000, p 22, illus p 23. Matthias Schulz, Der Spiegel , ‘Zauberin im Garten Eden’, Hamburg, 14 Apr 2001, pp 188–201: col illus pp 188–89 and on cover. Wendy Sharpe, Look , 'The art that made me', Sydney, Dec 2015-Jan 2016, pp 12–13: p 13, col illus p 13. Herbert Sharp, Studio , ‘A short account of the work of Edward John Poynter’, London, Feb 1896, pp 3–15: pp 13–15. [M H Spielmann], Magazine of Art , ‘Edward J. Poynter, PRA’, London, 1897, pp 111–20: p 120. Steven Weitzman, Cantor Arts Center Journal , 'Receiving the Queen of Sheba', Stanford, 2010-2011, col illus p 38. Times , ‘Mr Poynter’s “The Queen of Sheba”’, London, 17 May 1890, p 17. Athenaeum , 'Minor exhibitions', London, 31 May 1890, pp 710–11. Athenaeum , ‘The Royal Academy (first notice)’, London, 03 May 1890, p 571. Saturday Review , ‘Two exhibitions’, London, 21 Jun 1890, pp 768–69. Magazine of Art , ‘Art in June – The Chronicle of Art’, London, 1890, p xxxiv. Athenaeum , ‘The Royal Academy (second notice)’, London, 16 May 1891, pp 641–43: p 643. Concerning reduced ‘much improved’ version. Times , London, 28 May 1890-27 Jun 1891. McLean’s Gallery advertisements. Sydney Morning Herald , ‘The Solomon and Sheba picture’, Sydney, 12 Nov 1892, p 7. Daily Telegraph , 'That picture', Sydney, 03 Mar 1893, p 3. Daily Telegraph , 'That picture again', Sydney, 07 Mar 1893, p 6. Daily Telegraph , 'That picture', Sydney, 17 Mar 1893, p 6. Daily Telegraph , ‘A new picture at the National Art Gallery: “Vive l’Emperor [sic]”’, Sydney, 13 May 1893, p 9. Sydney Morning Herald , 'The Art Gallery', Sydney, 14 Sep 1893, p 3. Sydney Morning Herald , 'The new loan exhibition', Sydney, 01 Sep 1894, p 5. Daily Telegraph , ‘The National Gallery: five new pictures’, Sydney, 27 Oct 1894, p 5. Bulletin , 'Society', Sydney, 01 Jun 1895, p 15. Daily Telegraph , ‘Pictures for the country’, Sydney, 03 Aug 1895, p 9. Sydney Morning Herald , ‘Mr Villiers on local art’, Sydney, 25 May 1895, p 6. Art Journal , ‘New art publications’, London, May 1894, p 159, illus p159. Daily Telegraph , 'Pictures for the country', Sydney, 03 Aug 1895, p 9. The art of painting in the Queen’s reign, being a glance at some of the painters and paintings of the British school during the last sixty years , London, 1897, p 189. British contemporary artists , London, 1899, p 257. Catalogue of the loan collection of pictures by living British painters , London, 1900, pp 27–28, no 28. Times , ‘Art in Liverpool: the autumn exhibition’, London, 18 Sep 1900, p 10. National Art Gallery of New South Wales (report of the trustees for the year 1899) , Sydney, 1900, p 1. Loan to Guildhall ‘for their Summer exhibition… of the works of leading British artists’. Thirtieth autumn exhibition of modern pictures in oil and watercolours , Liverpool, 1900, pp 57–59, no 900. Athenaeum , 'Exhibitions', London, 14 Apr 1900, pp 472–73: p 472. Pall Mall Gazette “Extra” , ‘The pictures of 1901’, London, May 1901, illus on cover. Photograph of the artist standing in front of the picture (in a temporary frame), the oil sketch standing on the ground in front. Landscape painting from nature in Australia: a manual for the student in oil and water colours , Sydney, 1902, p 33. Drawings of Sir E J Poynter, Bart, PRA , London, , p 10. Studies illus pls 22, 38. The Royal Academy of Arts: a complete dictionary of contributors and their work from its foundation in 1769 to 1904 , London, 1905-1906, vol 6, 1906, p 198. National Art Gallery of NSW illustrated catalogue , Sydney, 1906, pp 15–18, illus p 16. Picture study in schools: records of the Education Society , Sydney, 1913, pp 31, 47–49, illus p 48. A century of loan exhibitions, 1813–1912 , London, 1913-1915, vol 2, 1913, p 958. National Art Gallery of NSW illustrated catalogue , Sydney, 1917, p 38, no 38, illus p 19. Allgemeines Lexikon der bildenden Künstler von der Antike bis zur Gegenwart , Leipzig, 1907-1949, vol 27, p 332. Times , ‘Bequest of pictures to the nation: the late Lady Tate's selection’, London, 17 Jan 1920, p 13. National Art Gallery of NSW illustrated catalogue , Sydney, 1924, p 26, no 58. New South Wales Art Gallery Pictures , Sydney, 1931, np, illus. Illustrated souvenir: eighty reproductions from the collections of the National Art Gallery of New South Wales: a selection of eighty reproductions mainly from the Australian collection and including examples from the British, French and Dutch , Sydney, [circa 1950], illus p , pl 61. Illustrated souvenir: eighty-two reproductions from the collections of the Art Gallery of New South Wales: a selection of eighty-two reproductions mainly from the Australian collection and including examples from the British, French and Dutch , Sydney, [circa 1958], illus p , pl 61. Art Gallery of New South Wales picturebook , Sydney, 1972, col illus p 36. Olympian dreamers, an exhibition of Victorian classical paintings, watercolours, drawings and prints, to celebrate the publication of Christopher Wood’s ‘Olympian Dreamers’ by Constable in October 1983 , London, 1983, under no 15. An introduction to Victorian painting , New Haven, 1985, illus p 77. English 19th century pre-Raphaelite and academic drawings, watercolours, graphics and paintings , New York, 1986, np, under no 68. Catalogue entry on photogravure. Art Gallery of New South Wales annual report for the year ended 30th June 1989 , Sydney, 1989, p 15. Acquisition of related drawings. Horisont: historia, religion, samhalle, geografi, 1, Lärobok i samhällsorienterande ämnen för högstadiet , Stockholm, 1989, col illus p 187. The letters of Rudyard Kipling, vol 1, 1872-89 , London, 1990, pp 369–70. Victorian drawings and watercolours , London, 29 Oct 1991, p 14, no 8. Dignity and decadence: Victorian art and the classical inheritance , London, 1991, illus p 334. Fine Victorian pictures, drawings and watercolours , London, Mar 1993, p 31, under no 42. The art of faith: the story of the Bible through the eyes of great artists , Hampshire, 1997, pp 34, 95, col illus p 35. Art Gallery of New South Wales annual report 1997 , Sydney, 1997, p 36. Conservation treatment. Sydney Morning Herald , ‘Great art seen in a poor light’, Sydney, 17 Apr 1998, p 12. Art Gallery of New South Wales annual report 1999 , Sydney, 1999, p 21. ‘The Visit of the Queen of Sheba to King Salomon by Edward Poynter, 1884–1890. The frame revisited’, AICCM Bulletin, vol 25 , Dec 2000, pp 21–32. Pre-Raphaelites and Olympians, selected works of Victorian art from the John and Julie Schaeffer and the Art Gallery of New South Wales collections , Sydney, 2001, pp 5, 46–47, col illus pp 47 (detail), 50. Queen of Sheba: treasures from ancient Yemen , London, 2002, pp 14, 23–26. Art Gallery of New South Wales annual report , Sydney, 2003, p 20. Gift of photogravure. Eccleston Du Faur: man of vision , Berowra, 2004, p 49. The Ingram collection: drawings & watercolours from the collection of the late Michael Ingram… , London, 08 Dec 2005, no 250. Figure study. The collection of Giorgio Marsan and Umberta Nasi , London, 13 Dec 2007, p 179, no 530. The story of St Stephen’s church South Dulwich: a beacon in times of peace and war , London, 2007. J W Waterhouse: the modern pre-Raphaelite , Netherlands, 2008-2010, p 108. Les Juifs Dans L'Orientalisme , 'La bible est née en orient', Paris, 2012, col illus p 116. Illustrated in reference to cat.nos. 59 and 60. Prints & drawings Europe 1500-1900 , Sydney, 2014, col illus p 168. Art Gallery of New South Wales annual report 1991 , Sydney, 1991, p 25. Acquisition of four related drawings. Connoisseur , ‘Current art notes: Sir Edward John Poynter, PRA, 1836–1919 [obituary]’, London, Sep 1919, pp 52–53: p 52. New York Times , 'Authors and artists: Mr Whistler offended – Zola promises a new novel', New York, 14 Aug 1892, p 5. Yemen: le pays de la reine de Saba , 'Yemen: le pays de la reine de Saba', Paris, 1997, p 26, col illus p 27. Victorian visions: nineteenth century art from the John Schaeffer collection , Sydney, 2010, p 15. A singular voice: essays on Australian art and architecture , Sydney, 2009, p 176. Vaelluksia maisemaan. Taiteen mestarit meren äärellä [Expeditions to the seascape. Art masters by the sea] , Helsinki, 2017, col illus p 37. Look , 'Tours', Sydney, Mar 2016, col illus p 43. Love and Death: art in the age of Queen Victoria , Adelaide, 2001-2002, p 166, col illus pp 157 (detail), 167. The illustration on page 157 is a detail. Art Gallery of New South Wales annual report 1999 , 'Director's Introduction', Sydney, 1999, p 6. Art Gallery of New South Wales annual report 1998 , 'Exhibitions', Sydney, 1998, col illus p 22. Orientalism – Delacroix to Klee , Sydney, 1997-1998, pp 18, 42–43, 90–93, no 34, col illus p 91. British painting 1800–1990 in Australian and New Zealand public collections , Sydney, 1997, p 147, no 1785. Time through painting: 17th century II, Journey into the Masterpieces , Tokyo, Dec 1993, p 101, no 5–6, col illus p 101. Solomon's legacy: a history of Israel from the death of King Solomon to the return from exile , Melbourne, 1993, col illus on the cover. State of the art: a guide to art galleries & museums in Australia , 1992-1993, illus p 22. The Bible in Art , New York, 1991, p 139, col illus pp 140–41. Art Gallery of New South Wales catalogue of British paintings , Sydney, 1987, pp 156–57, illus p 156. Portrait of a Gallery , 'European art in the old courts', Sydney, 1984, p 16, col illus p 17. History and legend in some selected paintings at the Art Gallery of New South Wales , Sydney, 1980, p 2, illus p 2. Victorian Olympians , Sydney, 1975, pp 25–26, no 30, col illus on cover. Art Journal , London, 1897. Sydney Morning Herald , ‘Review of the year 1892: Art’, Sydney, 31 Dec 1892, pp 5–6: p 6. 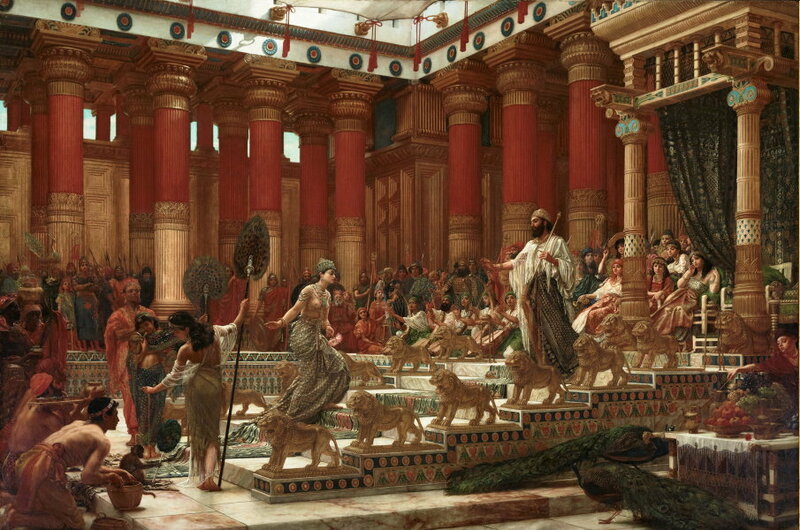 The meeting of Solomon and the Queen of Sheba by Edward J. Poynter, RA , London, 1890. Reprinted Sydney, 1892 and partially reprinted in the Art Gallery of New South Wales catalogue 1906. Daily News , 'In the studios [second notice]', London, 04 Apr 1881, p 2. Pall Mall Gazette , 'Notes', London, 25 Jun 1881, p 22. Athenaeum , 'Fine-art gossip', London, 25 Jun 1881, p 855. Derby Mercury , ‘Literary and artistic’, Derby, 05 Sep 1883, p 6. Magazine of Art , 'Art in December', London, 1884, pp ix–xii: p ix. Artists at Home , London, 1884, p 81. The accompanying illustration shows Poynter in his studio with the watercolour version of the Queen of Sheba on an easel. Magazine of Art , ‘Art in December – The Chronicle of Art’, London, 1884, pp ix–xii: p ix. Newcastle Weekly Courant , 'Art and literature', Newcastle upon Tyne, 13 Feb 1885, p 6. Pall Mall Gazette , 'Literary and art notes etc', London, 30 Jul 1886, p 6. Western Mail , ‘Literary, art, and dramatic notes’, Perth, 02 Aug 1996, p 3. Bristol Mercury and Daily Post , ‘Literary and other notes’, Bristol, 02 Aug 1886, p 6. Aberdeen Weekly Journal , ‘Literature, science and art notes’, Aberdeen, 03 Aug 1886, p 2.